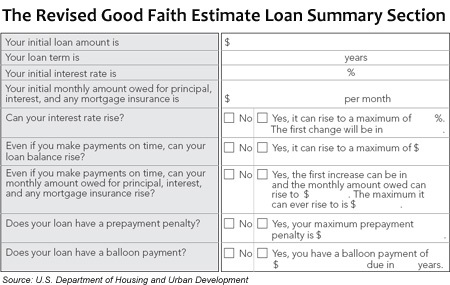 The new Good Faith Estimate makes its debut January 1, 2010. The new format will make it easier for Indianapolis home buyers to compare loans. Expanded from 1page to 3, the legislators responsible for the new Good Faith Estimate want it to be simpler for homeowners and home buyers to understand than the former version. By most accounts, Congress will meet this goal. Currently, this information is spread across 3 separate forms. Furthermore, the new Good Faith Estimate simplifies rate-and-fee comparisons, showing applicants how a lower rate can be available for a higher set of fees, and vice versa. For all of its clarity, though, the new Good Faith Estimate still fails to address the issue of 'suitability'. As in, is this the right loan for the right borrower? That's something only a loan officer can do. For suitable advice, talk with a loan officer who both listens to your needs and helps you plan for them. Great terms on an unsuitable loan are often worse than 'good' terms on the right one. If you need a recommendation for a great loan officer, let me know. It does change things... though my lenders are stressed, I think this is a net benefit to home buyers. One thing we'll have to deal with is the end of pre-approvals. One of lenders told me yesterday they won't be able to offer the pre-approval anymore because they can't do the Good Faith without a contract. So, there will be pre-quals, but no pre-approvals with offers. Its good to re-connect. Hope you are doing well. Thanks for showing all the detailed information in such a lovely blog as i was searching on the net and got connected with this blog. I appreciate your hard work you have put in for compiling such an amazing & informative blog!!! :) i will be monitoring all your updates from time to time. Maze of information, clustered in one place, Great! I think this is a great way to display information to those that may not easily understand loan agreements. Having easily worded information and a nice comparison sheet will be very helpful. It looks like it will def. make it easier for the buyers to read. Just kinda stinks that lenders will not be able to do pre-quals any more though. Prequals are worth a million bucks now days!